August 14, 2012 at 3:32 am. The Southeastern Conference was hit hard by injuries to Heisman Trophy candidate running backs last season when Marcus Lattimore of South Carolina and Knile Davis of Arkansas went down with season-ending injuries. Both are reportedly back to full health and ready to resume their chase for college football’s most valued prize. But there is one other outstanding running back that SEC fans might not be familiar with who could throw his hat into the Heisman chase … if he’s 100 percent healthy. He’s not been given the same publicity as Lattimore and Davis because when he suffered his season-ending injury last year he wasn’t even an SEC back. In fact, his team was not even an SEC team. He’s Henry Josey, a 5-foot-10, 190-pound junior from Angleton, TX., and he is a running back for the Missouri Tigers, one of the SEC’s two newest members. When he went down in the Texas game on Nov. 11, he had the fifth-best rushing season in team history — 1,168 yards, nine touchdowns and an 8.1 yard-per-carry average. He was leading the Big 12 Conference and was fifth nationally in rushing (finished 2nd and 12th, respectively). Dr. Smith had to fix the meniscus and the MCL had to be repaired and reconstructed. “I feel like he has got inner strength. He’s a fine young man and, hopefully, his body has got great healing potential,” Dr. Smith said. At the time of the injury, he knew Josey would not play football again in the spring, and he couldn’t say for certain that he would ever play again. Josey, however, worked hard at his rehab with the intent on returning to the football field again — and soon. Although he does have the luxury of a redshirt season if needed, Josey was determined to do whatever possible to play in 2012. 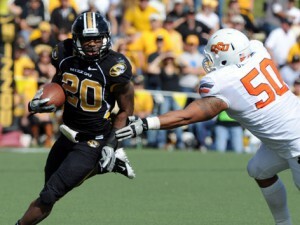 Josey did miss the spring as expected and, while a final determination about his final two years of eligibility has yet to be officially announced, the Tigers are proceeding as if Josey is going to be back on the field when Missouri opens its season on September 1 against S.E. Louisiana. It would also be a major boost to have Josey back, especially since the Tigers host Georgia the following week. A healthy Josey could potentially give Missouri a potent set of skill players with the return of quarterback James Franklin, wide receiver T.J. Moe and tailback Kendial Lawrence, who stepped in for Josey after the injury and picked up 373 yards in the final four games of the 2011 season. The Tigers have been hit hard with injuries this fall along the offensive line, however, so Josey’s return could be more of a confidence booster than anything. Josey didn’t participate when Missouri opened practice but was busy doing rehab work on the side. Gary Pinkel told reporters that Josey was progressing in his rehab and that no decision has been made on 2012, but that there is no timetable to rush him back to the field. “Time will tell,” Pinkel said. “I would suggest that it’s going to be difficult, just in terms of timing. The most important thing is he’s healed, he’s 100 percent and he’s ready to go. That’s the most important thing because he’s got two years left, and we want to be smart about what we do. Josey’s career at Missouri got off to a great start. He scored touchdowns on three of his first four collegiate carries and wound up with 437 yards and five touchdowns in 13 games. He was named Missouri’s Freshman of the Year. Josey’s sophomore season was even better until he want down against Texas. He had 145 carries for 1,168 yards and nine touchdowns for an 8.1 yard-per-carry average. He also had 10 catches for 91 yards and 149 yards on six kick returns. The Tigers continue to prepare for the season with or without Josey. Missouri has the comfort of having Lawrence on the roster as well as sophomore Marcus Murphy. The Tigers had Sunday off but were back on the practice field twice on Monday. They will hold a single practice in full pads on Tuesday.